Exploring Antarctica in an authentic expedition style, aboard an authentic expedition ship is an incomparable experience, and your guarantee of an in-depth encounter with all its wonders. Expedition’s pioneering polar heritage and 50 years of experience navigating polar geographies is your assurance of safe passage in one of the wildest sectors of the planet. 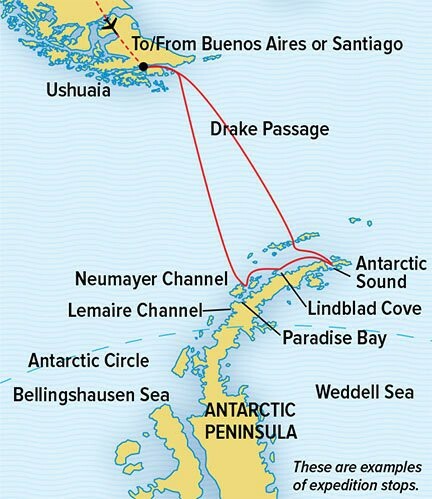 You’ll get out on adventures every day we’re in Antarctica, sometimes twice a day—to walk or hike, kayak or Zodiac cruise among the bergs. You’ll have a choice of activities each day, and the option to join the naturalist whose interests mirror yours. Choice also includes opting to enjoy the view from the bridge, the all-glass observation lounge, the library or the chart room. To visit the fitness center with its panoramic windows, or ease into the sauna or a massage in the wellness center. • Benefit from our 175 collective years of Lindblad-National Geographic expedition experience to see and do all you came for and more. This extraordinary new voyage is like a blockbuster film—the star is the seventh continent. And the co-stars are the big ice of remote West Antarctica, where we are sure to ......click here to read more. On a voyage aboard the new National Geographic Endurance, sail across the North Sea in the wake of legendary explorers and seafarers, traveling from Norway’s breathtaking fjords and snow-dusted mountains ......click here to read more.